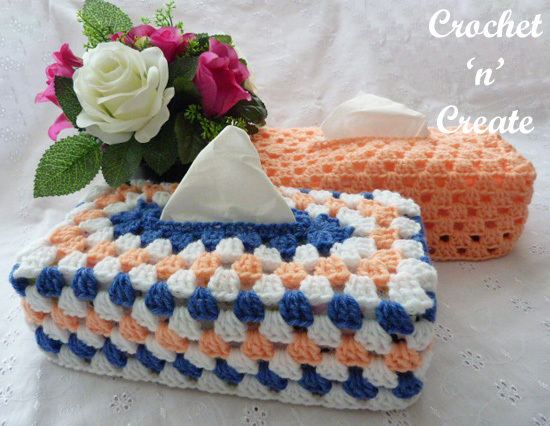 Crochet Granny Tissue Box Cover – This the second in my series of tissue box covers, my first Cover was such a joy to design, so I thought I would continue with my Granny stitch theme and add this pattern too. Top – Made in rounds without turning throughout. With color 1 ch36 loosely, sl st to first ch to form a ring. 2nd Row – ch3, (2dc, ch3, 3dc, ch3, 3dc) in base of ch3, ch1, * skip 2sc, 3dc in next sc, ch1, * rpt from * to * 4 more times, skip 2sc, (3dc, ch3, 3dc, ch3, 3dc) in next sc, ch1, rpt from * to * to last 2sc, skip sc’s, sl st to top of ch3 on beginning of row. 3rd Row – sl st color 2 to first ch3 space, ch3, (2dc, ch3, 3dc) in same space, ch1, (3dc, ch3, 3dc) in next ch3 space, ch1, * work 3dc, ch1 in each of next 6, ch1 spaces, (3dc, ch3, 3dc) in next ch3 space, ch1, (3dc, ch3, 3dc) in next ch3 space, ch1, work 3dc, ch1 in each of next 6, ch1 spaces, sl st to top of ch3 on beginning of row. 4th Row – sl st color 3 to first ch3 space, ch3, (2dc, ch3, 3dc) in same space, ch1, 3dc in next ch1 space, ch1, (3dc, ch3, 3dc) in next ch3 space, ch1, * work 3dc, ch1 in each of next 7, ch1 spaces, (3dc, ch3, 3dc) in next ch3 space, ch1, 3dc in next ch1 space, ch1, (3dc, ch3, 3dc) in next ch3 space, ch1, * 3dc, ch1 in each of next 7, ch1 spaces, sl st to top of ch3 on beginning of row. 5th Row – sl st color 2 to first ch3 space, ch4, (2trc, ch3, 3trc) in same space, ch1, 3dc, ch1 in each of next 2, ch1 spaces, (3trc, ch3, 3trc) in next ch3 space, ch1, * work 3dc, ch1 in each of next 8, ch1 spaces, (3trc, ch3, 3trc) in next ch3 space, ch1, 3dc, ch1 in each of next 2, ch1 spaces, (3trc, ch3, 3trc) in next ch3 space, ch1, * 3dc, ch1 in each of next 8, ch1 spaces, sl st to top of ch4 on beginning of row. 6th Row – sl st color 1 to first ch3 space, ch3, 2dc in same space, ch1, work 3dc, ch1 in each ch space to end, sl st to top of ch3 on the beginning of row. Starting with color 2, sl st to a ch1 space, rpt 6th Row alternating colors 1, 2 & 3 as before until 11 rows have been worked in all from beginning. 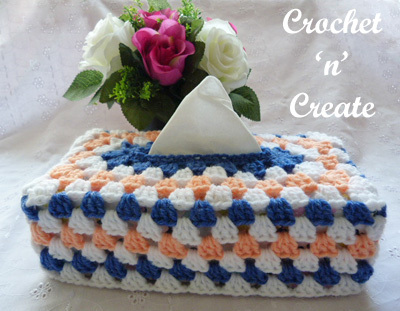 The written instructions and pictures for this lovely crochet granny tissue box cover pattern are copyrighted to crochet ‘n’ create © 2018.
back to crochet ‘n’ create. If you wish to tell your friends and followers about this pattern, please only use a direct link to the pattern page on crochet ‘n’ create. 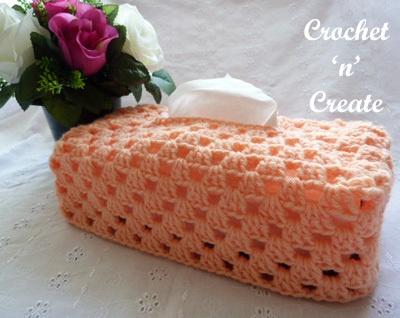 DO NOT share the written instructions for this crochet granny tissue box cover pattern. 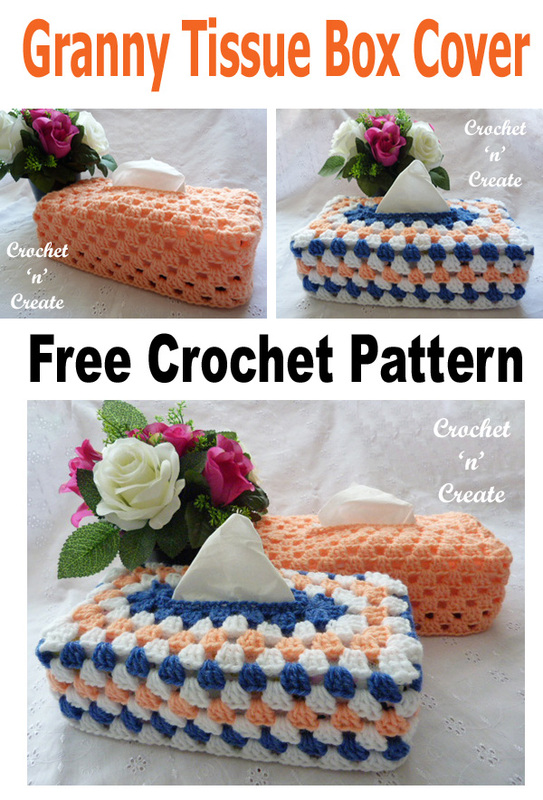 This entry was posted in crochet for the home, Tissue box covers and tagged crochet, crochet for home, crochet patterns, crochet tissue box covers on 11th August 2018 by crochetncreate.